At the Silver Tips Munnar resort, keeping in mind our theme, celebrating movies, our restaurants showcases this very thematic aspect. 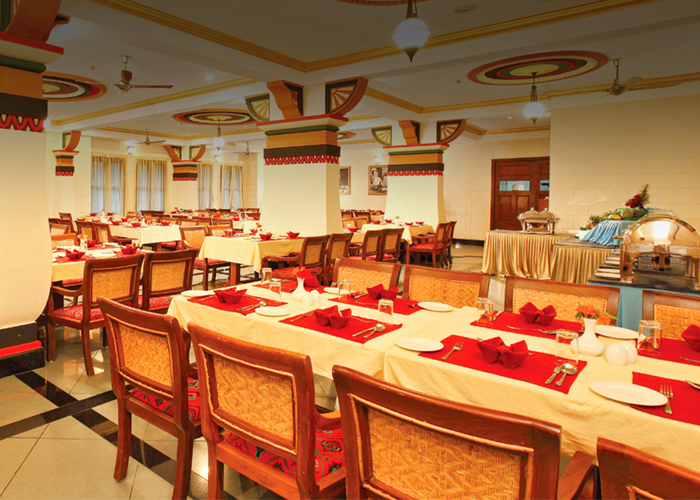 We have 4 restaurants, featuring, 'Mayabazaar' a lively all-day dining multi-cuisine restaurant. Entice your palate at the rooftop 'Majilis', the specialty middle-eastern cuisine that recreates the cuisine from the region. For a quick nibble, baked goods and steaming cups of coffee and tea, step into our all-day coffee shop, 'The Sound of Music' And if you want to just perk up and feel nice and light,then 'Tom and Jerry' with their novel and select menu will keep you refreshed and energized. One of our main restaurants located at the lobby level, 'Mayabazar' is based and themed on a 1957 mythological Telugu film. This critically acclaimed movie featured stalwart actors like NTR, Gemini Ganesan and Savitri. This film is considered as one of the best classics of Indian Cinema and this landmark movie showcased the best of cinematography, art direction and visual effects available at that time. The restaurant interiors, the furnishings, furniture, the color coordinates and the overall effect are a replica of the opulent setting of a palace in the movie. In the restaurant we serve authentic Indian, Continental, Chinese, Arabic and Lebanese cuisines. We serve both an elaborate multi-cuisine buffet and a select a la carte menu too. Our thematic and tasteful buffet meals in the restaurant are a treat to the eye, taste buds and your senses. Savour and enjoy a sumptuous spread of carefully chosen, choice menu from all over the world. The menu includes a perfect spread of assorted Indian and global cuisine comprising of main courses, live counters, appetizers and desserts.